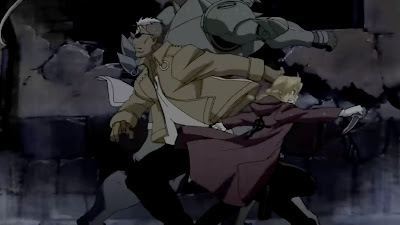 One reason that I wasn't a big fan of the original Fullmetal Alchemist is that I felt it was lack of pace. I'm sure many would disagree with me on this, but that's just how I felt. This new series, definitely does not have that problem. It's ultra compact and super fast in pace, where it packed twice amount of contents in the first five episodes than the original series. I don't know if it'll eventually slow down, but if they do keep up the pace like this throughout the series, they could compress the whole original series into a single long season.